This eye-catching PickMe posy is made from the freshest blooms of the season and is presented in a beautiful glass vase. Perfect gift for Hospital Delivery, Birthday present or as a special thank you gift. YES - we can make your design in any colour palette - just tell us in the Notes to Florist section of your order. 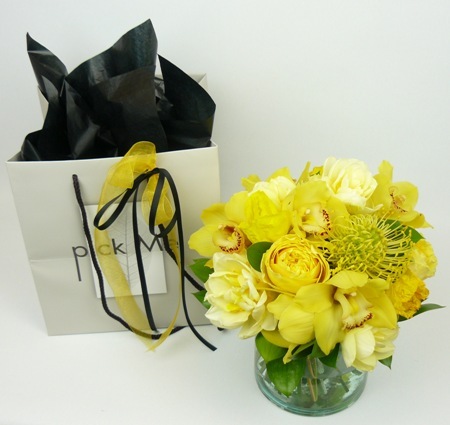 Your beautiful gift will be cradled in tissue in an attractive PickMe carry bag, and is trimmed with ribbon and completed with a card containing your personal message to make a lovely gift delivery! Order by 10.30am for Business Delivery. Order by 1pm for Same Day Home Delivery Monday - Friday.